Despite its obvious membership in the order Hemiptera, I knew the insect featured in ID Challenge #7 would be a difficult subject to identify. This bizarre bug is Cyrtocoris egeris, a member of the small pentatmoid family Cytocoridae (congratulations to HBG Dave, who was the only commenter to correctly identify not only the family, but the genus). 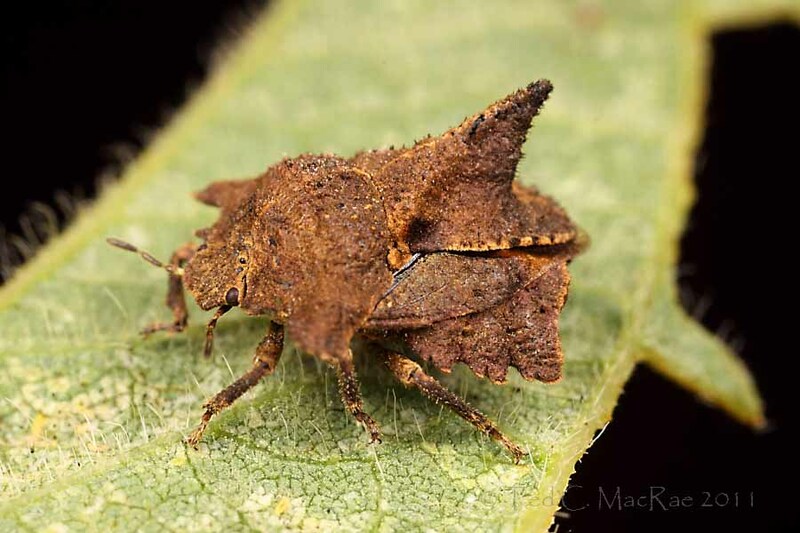 While their relationship to Pentatomidae (stink bugs) and Scutellaridae (shield-backed bugs) is obvious, hemipterist-great Carl Schaefer thinks these insects might actually be most closely related to the Cydnidae (burrowing bugs). I encountered this individual a couple of weeks ago in a soybean field in Santa Fe Province, Argentina. Now, I have to be honest here – I did not figure this one out on my own. Instead, I assumed it must be some bizarre member of the Pentatomidae or Scutellaridae, and it was only after my repeated searches in either of those two families failed to turn up anything promising did I throw up my hands and call for hired help. This time it was USDA Research Entomologist Don Thomas, a pentatomid specialist (and former co-alumnus at the University of Missouri) who responded to my query with a genus-level ID. Once I had that bit of information in hand I was able to locate the recent revision of the family (Packhauskas and Schaefer 1998) and identify the species. In addition to the expanded scutellum bearing a broad-based spine or hump, members of this exclusively Neotropical family are characterized by flattened expansions of the anterior part of the head, the covering of flattened scalelike setae, and a mediodistal tubercle on at least the foretibiae. Packauskas and Schaefer (1998) recognize only three genera and 11 species in the family, its members occurring from Argentina north through central Mexico. ...but there's some crazy stuff going on at the back end. My ID as C. egeris is based on the very well-developed scutellar crest and my interpretation of the humeral projections not extending forward of the anterior angles next to the head. Packauskas and Schaefer (1998) recorded this wide-ranging species from Mexico to Argentina, with the southernmost specimens in extreme northeastern Argentina (Pcia. Missiones), but Schaefer et al. (2005) later recorded it from Reconquista – also on soybean. Cyrtocoris gibber is very similar to C. egeris and is also widespread from Costa Rica to Argentina (and also with the southernmost record in Pcia. Missiones, Argentina), but in that species the humeral expansions project forward nearly as far as the anterior angles of pronotum (strongly surpassing a line drawn through the bases of these angles). Besides soybean for C. egeris, the only other host records I am aware of for any species in the family are by Costa Lima (1940), who reported C. gibbus on the branches of Mimosa scabrella (Leguminosae), and Schaeffer et al. (2005), who reported C. tigrinus on Sida rhombifolia (Malvaceae) (although nymphs could not be reared to adulthood on this plant). Schaefer, C. W., A. R. Panizzi and M. C. Coscarón. 2005. New records of plants fed upon by the uncommon heteropterans Cyrtocoris egeris Packauskas & Schaefer and C. trigonus (Germar) (Hemiptera: Cyrtocoridae) in South America. Neotropical Entomology 34(1):127-129. 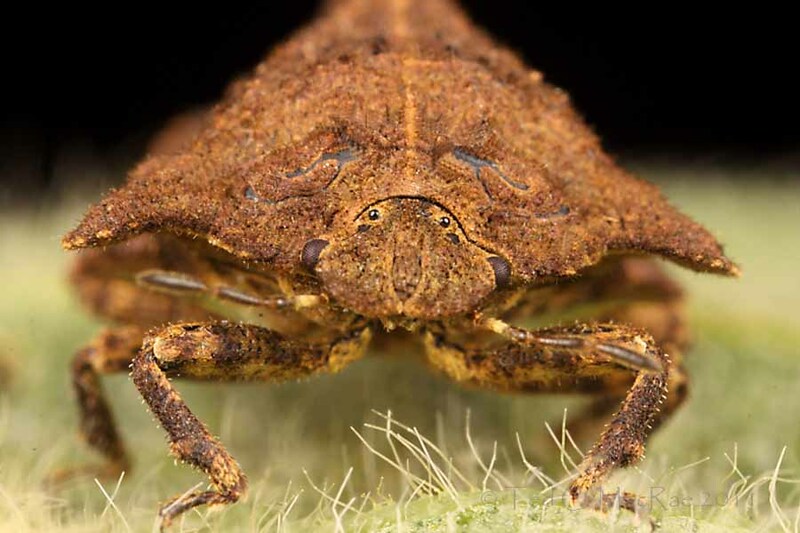 This entry was posted in Cytocoridae, Hemiptera and tagged Argentina, entomology, insects, nature, science, stink bugs, true bugs. Bookmark the permalink. Wow! Another obscure bug family to file away in the back of my mind and watch for when in the tropics. Very cool. I’d never heard of Cyrtocoridae until now. That’s one odd looking hemipteran. It immediately reminded me of a shark fin! Great macro shots! That is one cool bug, never seen such a spine on Pentatomid bugs. Nice bug, great photos! I’m getting more and more interested in True Bugs – all those great weird shapes! I also attended a lecture once in what’s now Slovenia about pentatomid vocalizations and parental care – only few beetles can match that, and those usually do it under ground on very smelly substrate. I didn’t know pentatomids exhibited vocalizations and parental care. A lot of the hoppers (esp. treehoppers) are quite well know for this. Why didn’t you tell me that you were going to Argentina? I would have put you in contact with a couple of people. But, then again, you probably didn’t need it. BTW, I am Beatriz Moisset at Bugguide. Here is a pentatomid mama practicing parental care in Cordoba, Argentina. Hi Beatriz – thanks for visiting. This trip to Argentina was all business, with little time for more leisurely pursuits. 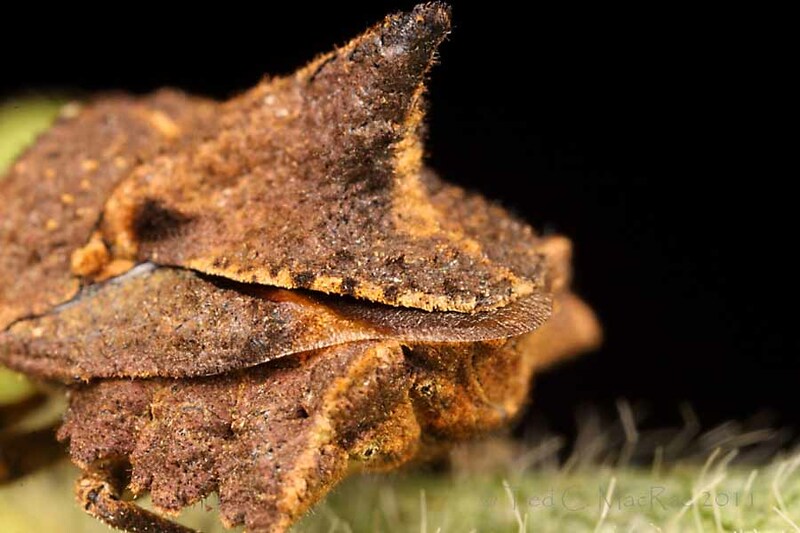 Awesome photo – I hadn’t realized pentatomoids practiced parental care to that degree. Yo he caminé tantos campos de soja en Argentina, y este is el unico que he encontrado. Creo que Reconquista es el limite de distribución de estes bichos.